So it has been a month since my last post. I was truly pissed at the whole website fail that I just was to angry too try to get something on the site. Of course that anger was mostly at myself because it was my own fault the domain lapsed. But now my buddy Josh has helped me get the domain back with a little extra coin spend (le sigh) and I'm ready to get posting once more. Of course 6th edition has launched in the past month and I have been trying to squeeze games in like crazy. I have not yet played my CSM as I figure I'll just wait until the new book comes next month. I've also not played my Imperial Fists which I am actually eager to do. I have also not played my Blood Angels because Descent of Angels is dead and it is an all jump pack army. It may be viable at some level but... I am pretty meh on it right now. 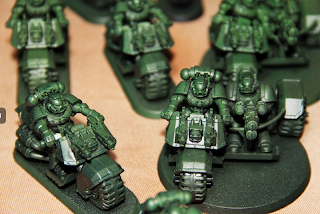 I have played my Templar, my Orks, my Tau, but mostly I've been playing the Marine bike army. The bike army is fun and is giving people fits. The only army that has really whopped my good is nob bikers, so I don't know that they will ever win a tournament as nob bikers are also greatly improved and I see a few of those making it to every big tournament. -They are now really T5 (matters for FNP and no insta kill on multiple wound models). -They now always have a 5+ cover save (instead of having to turbo boost for the save). -Shooting armies seemed to have gained the most in 6th edition, and marine bike armies are really mobile shooting armies. -You get to take your armor save against dangerous terrain now! -Add to that combat tactics to continue to break away from units to keep shooting is still great. -Premeasuring means against most armies you can stay in that 18-24" range to blast them but be out of charge range. -Alternatively you can tuck yourself just inside that 18" range to tempt people to charge and get some overwatch shots. Sure it is 6s to hit but with rerolls on bolters and a few low AP weapons to boot I have killed a fair share of guys trying to charge. -Allies can fill some holes (like a rune priest or far seer for anti psy protection). Here's a link to a video battle report from a few weeks ago done up at Frontline Games. Since then I have swapped out one of the min scoring bike units for an Eldar Farseer on a jetbike with 3 Gaurdian Jetbikes. 200 points of allied lov'n that helps shut down enemy psychic powers and is scoring to boot! The rune priest is a great option on a bike also, but then I'd have to take a squad of dudes on the ground and I'd rather keep the mobility of the army maxed out all the way! 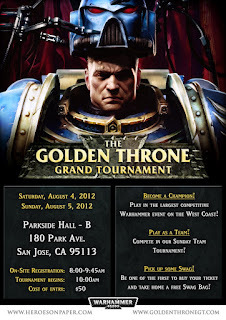 So the Golden Throne tournament is this weekend in the bay area and I have negotiated (quite literally) with the wife to be able to attend this two day event and I'm going to bring the bikes. I'm really looking forward to going if not to see how much of the 'meta' has shifted around. Will people have shifted away from traditional 5th edition lists? How many people will embrace the allies rules and how so? Will fliers just dominate the game right now? Even though the Golden Throne has removed all painting requirement events are what drive me to paint so I've been working on them. They wont be done done but they've come along way. Here is where they were when I bought them from Frankie at Frontline. It was a lot of bikes! 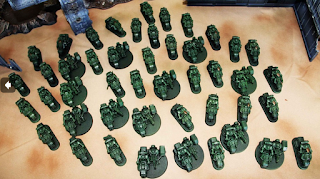 He got them assembled and got two or three layers of green airbrushed on the army. I debated what to do but I decided to keep them green. The one thing I knew I need to do though was make it so that I could 'duplicate' the airbrush process. So I decided to drop two more light layers of airbrushing on top of what he had done. This is where they are now. Not great pictures but it show there has been some progress. This army is by no means done, but I figured I'd get the baic basing done just to make them look... well, more done! I still need to wash the metal parts and do ALL the highlighting. So there is still a couple weeks of work to do, and that's just to get to 1500 points! Thought truth be told to get to 1850 I just need to paint 4 guys for the command squad and one Attack bike for that 4th troop unit. So we'll see how it goes and I'll report back. 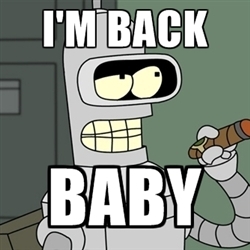 I'll give a few other thoughts on my armies and 6th edition over the next few days.